Schlemielintheory.com has hosted and posted many blog entries on Franz Kafka. I have had a guest post by Matthue Roth on his very popular book My First Kafka: Runaways, Rodents, and Giant Bugs, a guest post on Walter Benjamin’s reading of Franz Kafka by Hillel Broder, and more than ten of my own posts on the work of Franz Kafka. His work, without a doubt, is of great interest to this blog and my book project. 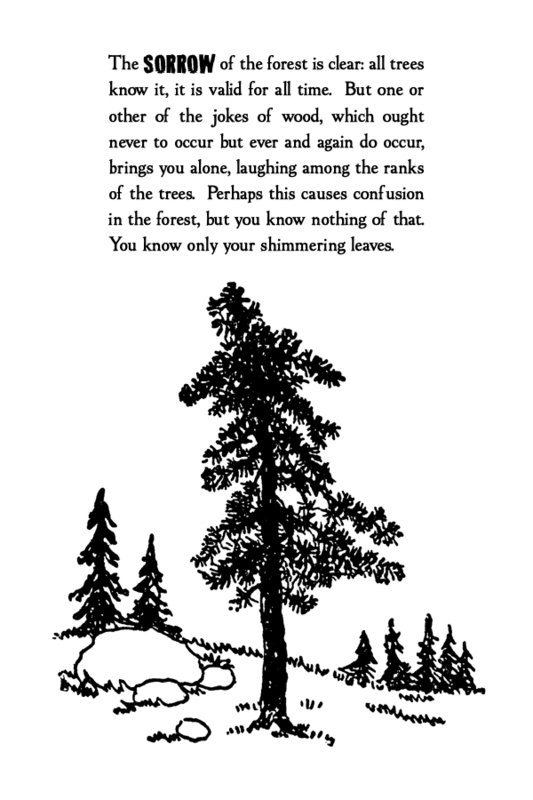 That said, I have recently come across an exceptional book that plays on Franz Kafka’s parables entitled Franzlations: The Imaginary Kafka Parables. This enchanting book was co-authored by Gary Barwin, Craig Conley, and Hugh Thomas. Gary Barwin is the author of fifteen books, which include works of poetry, fiction, and children’s fiction (here’s his blog). Like Barwin, Craig Conley is an eclectic writer whose books span fiction, mysticism, linguistics, pop culture, folklore, children’s fiction, and grammar. Hugh Thomas is a Canadian poet who has published a few books of poetry. In collaboration with each other, they have created a book that speaks to anyone who is interested not just in reading Kafka but in, so to speak, taking his work as the basis for new texts, images, and interpretations that “open” up the text to play and new meaning. Moreover, this book speaks to people who are well versed in what is called “intertextuality.” And by this I mean the textual practice of moving between texts which, in effect, offers new meanings (I will return to this below). I’d like to take a look at the interplay between text and text and text and (historical) image to illustrate how these texts open up horizons that I have not experienced in any previous academic readings or fictional plays on Kafka’s novels, short stories, or parables (as in Phillip Roth, Paul Celan, or Aharon Appelfeld’s work– to mention only a few examples of writers who engage in intertextuality with Kafka’s work). Although there are a number of ways to enter this text, I’d like to suggest reading it (for the first few times) in a linear manner. Playing on the text, I would like to suggest my own “Franzlation” of this book. 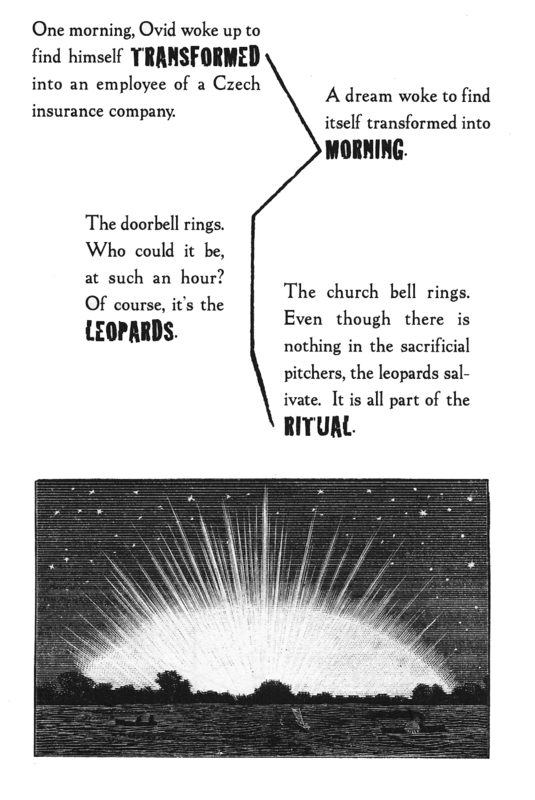 Taking the text as its guide, my reading looks to play on one of the central signifiers in this text: the parable. To be sure, the meaning of the parable is one of the main concerns of this text. The Oxford Dictionary defines parable as “a simple story used to illustrate a moral or spiritual lesson, as told by Jesus in the Gospels.” It comes from the Latin “parabola” which means comparison. Working with the Latin root, I would like to suggest that Franzlations works not by way of illustrating a “moral or spiritual lesson, as told by Jesus and the Gospels” as a textual-imagistic strategy to compare one text or image to another so as to “reinvent” Kafka’s text. This comparison has a spatial and a textual dimension, but, instead of illustrating a lesson from the Gospels, it articulates a number of relationships with which all of us are intimately familiar. We have stepped a few paces to the left in order to reinvent them. 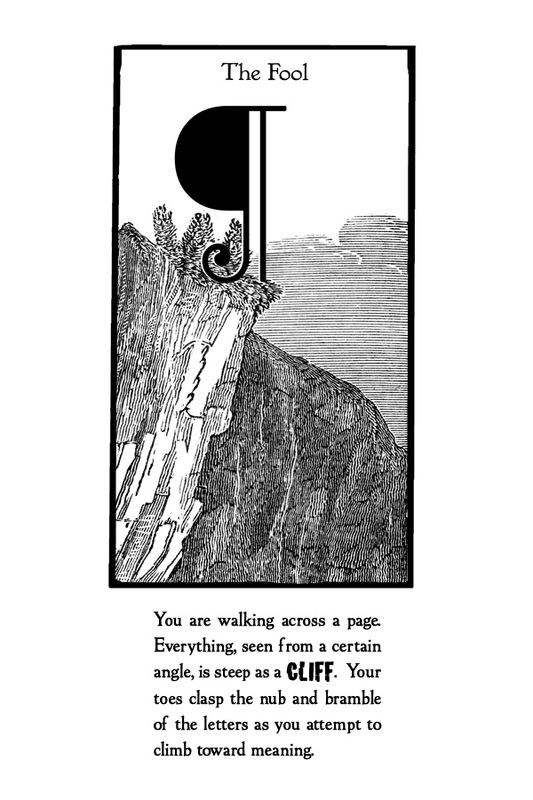 Sometimes this means we have walked off a cliff into the empty air. As you can see, the text for this image gives one a spatial coordinate for how one’s eye moves from text to image. 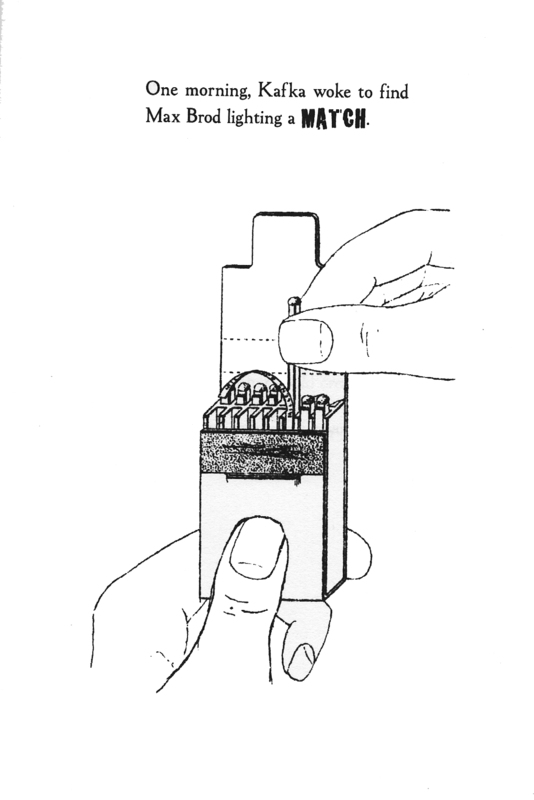 It is self-reflexive in the sense that it is a parable of reading in which the reader “clasps” at meaning as he/she “attempts to climb toward meaning.” This, let me stress, is likened to the movement of the fool (reader-writer) since it is a risk that most adult readers wouldn’t venture. And so it is clear, that at its heart, Franzlations is a collaboration. Between writers and writings. Between words and images. Between readers. Between the past, the present, and the future. For it is our belief that new writing is the imaginary future of past writing, even if that writing was never written. 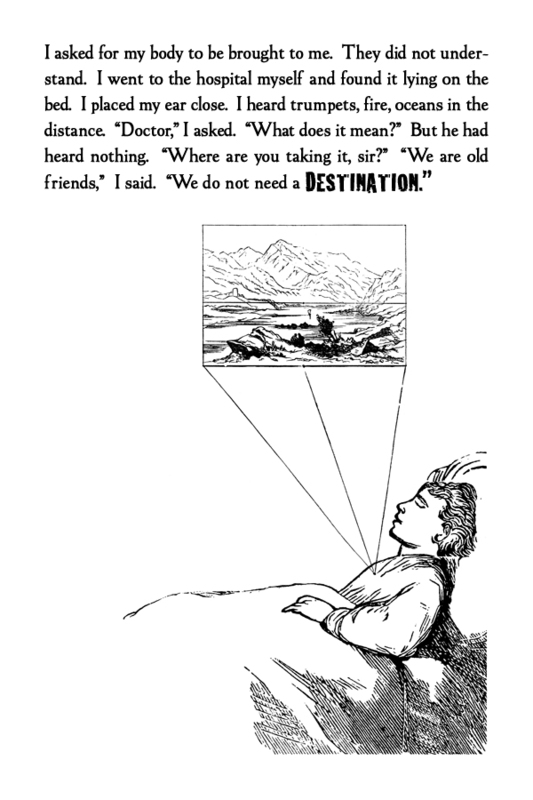 The text/image demonstrates the movement “between” things, images, times, and readers; and between Kafka and their text. This movement informs what they call the parable. 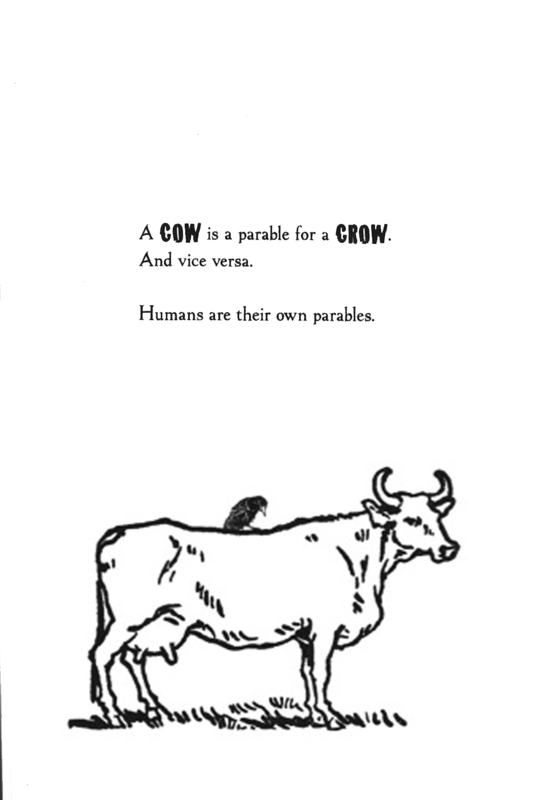 For instance, in an image of a cow and a crow, they write “A COW is a parable for a CROW. And vice versa. Humans are their own parables. And this suggests that one thing (parable) can be translated by another and that humans are parables of themselves (which suggests, based on this, that they are not themselves but something other). While the reader might see this as a free-for-all which lacks any connection to reality, I would like to suggest taking a look at page 8. 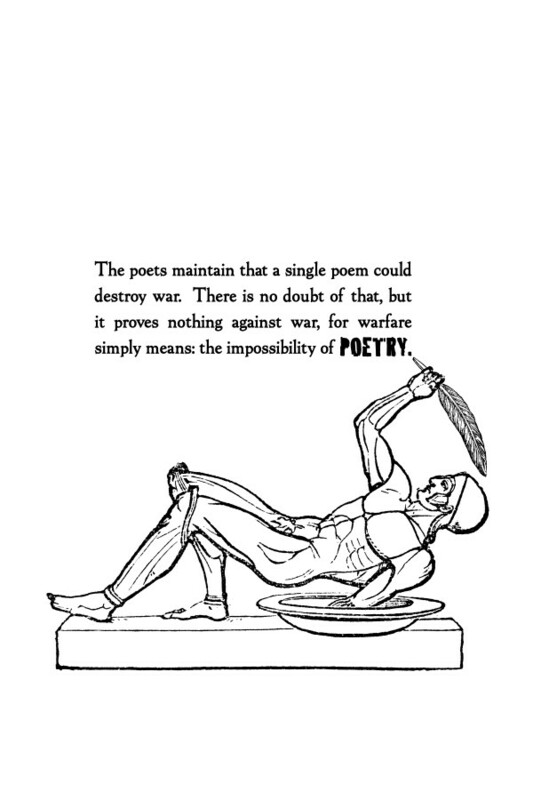 In this image-text, the proposition that “a single poem can destroy war” is tested. It suggests that war is the impossibility of poetry; and if the work of the between, the parabolic work, is poetry, then this suggests that this book is a challenge to war only insofar as it dwells in the parabolic. As Emmanuel Levinas notes in his book Totality and Infinity, war dwells in absolutes. 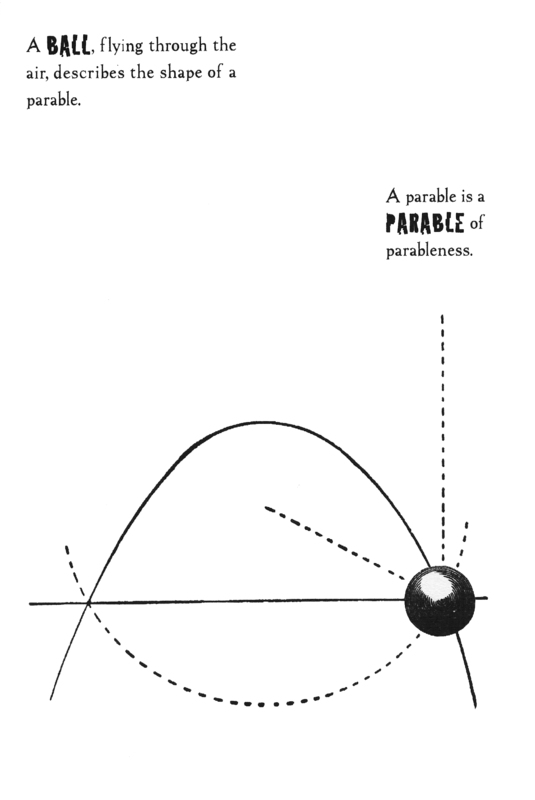 Franzlations, on the contrary, doesn’t deal in absolutes; it deals with the parabolic. As we can see in this image of a naked-man-warrior who is sloping parabolicly with a feather (away from war). The irony in this piece is that the floating away into the sky is also a melancholic image of loss. Silence is often associated with the tragic, not the comic. And the comic sound runs up against tragic silence. 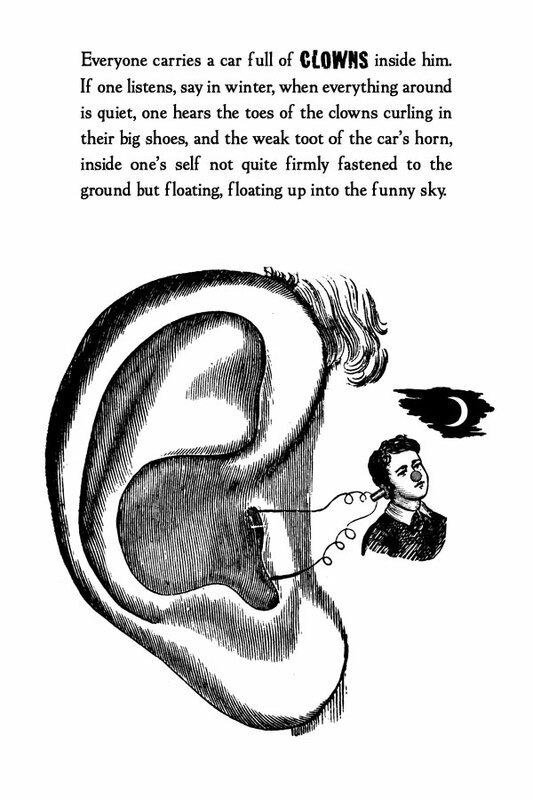 But although the sounds disappear there in the sky, this is not tragic; it is “funny.” This juxtaposition of the two makes for a depth and a paradox that takes this text out of the zone where textual play is the only thing on the table. This image speaks to me and my project. It suggests that the reader is child-like (a man-child/schlemiel of sorts). Yet, at the same time, it suggests an adult-awareness of sorrow and tragedy. This frission makes for a relation that I ponder often in schlemiel-in-theory. Namely, the relation between Sancho Panza and Don Quixote (a relation that both Kafka and Benjamin found so much interest). This awareness takes us into a space between the comic and the tragic which is also the space between childhood and adulthood. Franzlations, much like Walter Benjamin in his reflections on childhood terror, explores this zone of childhood as it relates to death. The text-image that brings this out is on page 44. This image and text play on this relation vis-à-vis a mystical image. In it we see a boy who appears to be dreaming of a land from the space of his heart. The text, however, suggests that he may be dead. It intensifies the claim by speaking in the first person: “I asked for my body to brought to me. They did not understand.” The boy speaks to a Doctor about this (which would, of course, be impossible, since he is dead). The doctor doesn’t hear him. The ensuing dialogue, we can suppose, is with himself. He will take his body away; but he has no destination for it: “We do not need a DESTINATION.” This implies that the body can be taken anywhere; this may be an allegory of the dead letter. On the other hand, it may just be a way of addressing death in a way that is steeped in the imagination and the “between” of life and death; dream and reality. The theme of terrified children and the “other world” is also seen on page 48. The antiquated images that are used for this (and other texts in Franzlations) bring us back to a cultural childhood (in the early 20th and late 19th century) where, it seems, the relation of childhood to death was of interest. It also helps us to “look back” at ourselves and our relation to death. 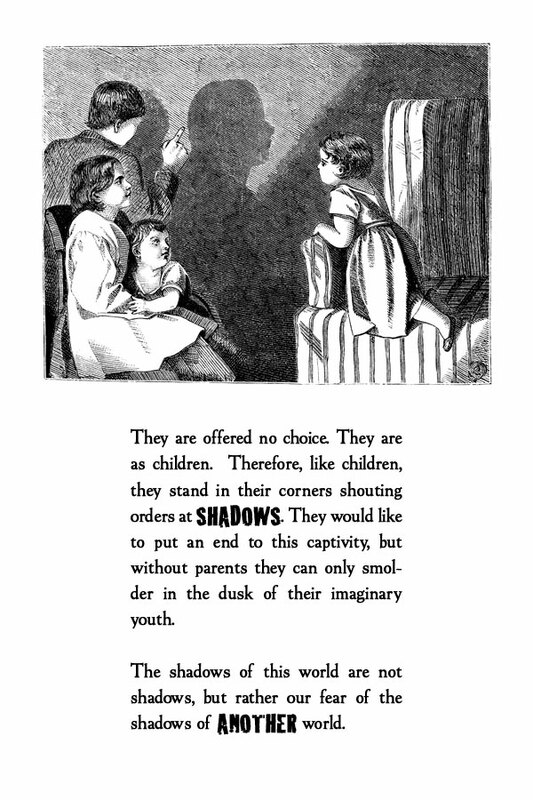 Here, “shadows” and “fear” are foregrounded. When I see this image, I also think of the shadows of words and images and the fear they evoke (as it were, the fear of unknown possibilities). But perhaps there is nothing to fear. 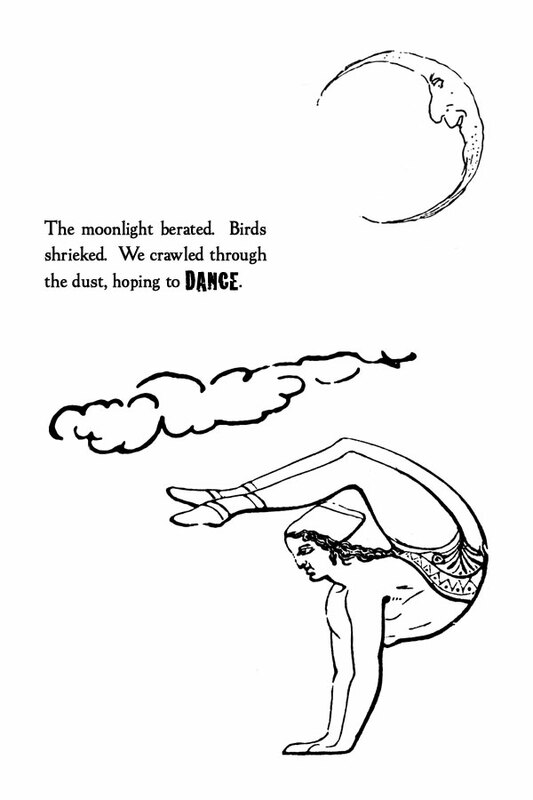 The end of Franzlations offers some comfort by way of offering us – as if we the readers are children – images of a man posing like a crescent moon above him. This movement itself may be comforting; like the image of a ball whose movement through space is also parabolic. Maybe there is hope at the end of the parabola. Maybe there is a new morning. Or is it just the course of the day or of a parabola? A ritual? All of these questions are left open for the reader to decide on. But, in truth, they are well posed. The images and the texts selected give me much food for thought as so much dwells in that arc between one thing and another – especially if that arc spans what is and what could be or between what was and what may be. These are the thoughts of children…and adults. The last image of Franzlations casts a possibility that never happened. As any scholar of Kafka knows, Kafka wanted his best friend Max Brod to burn all his work. But he didn’t. Playing on its task of translation, Franzlations purposefully misreads what actually happened (the texts were not burned and served as the basis for much of Franzlations’s musings). Here Kafka (playing on Gregor Samsa of “The Metamorphosis”) wakes up to find Brod lighting a match. He never did, but let’s take a moment to imagine that he did. For if he did, we, just like these authors, would have to “invent” another Kafka. Regardless…. they did invent or rather re-invent him! And for that, I am very happy: because the way they chose to reinvent Kafka brings us into a space that is made especially for schlemiel-readers (see the “fool” Tarot card above) who travel back and forth between adulthood and childhood, a space that is evoked by way of moving our eyes on a page between text and image, and between the past, present, and imaginary possibilities of the future.